For some, “getting away from it all” might mean a trip to the South Pacific -- some delightful tropical island far from the cares of everyday life. But really getting away from it all means going to a point in the South Pacific where there are no islands within almost 1700 miles. 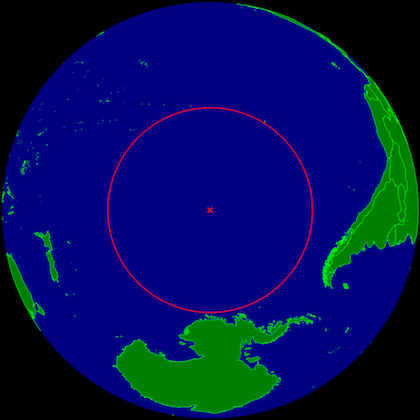 It’s the point on the globe that’s farthest from any land, known as Point Nemo. It was first calculated in 1992, with the help of computers and GPS satellites. It’s precisely 1,670 miles from three islands: Ducie Island, a member of the remote Pitcairn islands; Motu Nui, a member of the Easter Island chain, off the coast of South America; and Maher Island, off the coast of Antarctica. The spot was named after Captain Nemo, from Jules Verne’s classic novel “Twenty Thousand Leagues Under the Sea.” Nemo sought solitude in the ocean depths aboard his submarine, the Nautilus. Not much lives at Point Nemo. Ocean currents prevent nutrients from coming to the surface, so there’s little to sustain life. And not many ships cross the region, either. That’s just as well, because the region is a dumping ground for dead spacecraft. To keep them from possibly hitting inhabited regions, space agencies aim them toward the area around Point Nemo. About 260 craft have been targeted there in the last 45 years. Most of a spacecraft burns up as it enters the atmosphere. But some big pieces can survive and hit the ocean. When they sink to the bottom, they may form habitats for bottom-dwelling life -- out in the middle of nowhere.